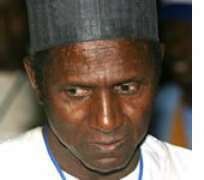 President Umaru Musa Yar'Adua is a sad man. He is not happy because of the inability of his party, the Peoples Democratic Party (PDP), to conduct primaries to pick its candidate for the February 6, 2010 governorship election in Anambra State. Vice-President Goodluck Jonathan disclosed this yesterday at the Anambra State Public Officers and Elders Forum (ASPOF) National Summit on Security and Development held in Abuja. Also, former Commonwealth Secretary-General, Chief Emeka Anyaoku, who spoke at the occasion, said peoples' votes must count in next year's governorship election. He said the politics of do-or-die and political godfatherism must not be allowed to rear its head in the February 6 election. PDP ward congress to elect delegates that will pick the party's flag bearer for the February 6 poll was riddled with confusion and violence. Following the inability of the party to continue with the process and the ensuing court cases by some aspirants, the 47 PDP aspirants were given time to elect a consensus candidate among themselves. It was when they failed that the party selected former Central Bank of Nigeria (CBN) Governor Chukwuma Soludo as its candidate for the poll. The vice-president said, “I don't want to go into whether they did the right thing or the wrong thing,” but stated that some of the aspirants who used court processes to delay and frustrate the party from electing the governorship candidate through the delegate election should be blamed. Jonathan blamed the inability of PDP to conduct a proper primary election to choose its flag bearer on the activities of some cabals in the state, and vowed that the federal government has the capability to break the cabals. President Yar'Adua had twice within the last one week invited PDP National Chairman Vincent Ogbulafor to Aso Rock Presidential Villa over the Anambra crisis. Yar'Adua had reportedly expressed the fear that if things were not properly done in Anambra, they could affect the 2011 general election. As part of efforts to ensure that the votes count, Jonathan said: “We are thinking that election results must be announced at the units. We know most of the units in Nigeria are less than 500 people; very few of them are more than 500. Election results must be declared at the units. So, party agents must have their copies at the units so that nobody will wait and when the election gets to the ward level or the local government level then somebody manipulates and celebrates himself as a king-maker. He challenged the people of Anambra and all Nigerians to support government's efforts at ensuring security, as there cannot be any development without adequate security. The vice-president explained that investment and investors would not venture into a place where there is no adequate security, and called on all Nigerians to support government to ensure adequate security for lives and property. The former Commonwealth secretary-general said that the votes of the people of Anambra State must count and appealed against the politics of do-or-die in the country. Anyaoku said: “I appeal to all those involved in Anambra State politics that Anambra people are sick and tired of politics of do-or-die. Politics should be about people and not self aggrandisement. Politics should be about enhancing the polity and not about personal hostility. The state Governor Peter Obi in his speech urged the people to take their destiny in their hands so as not to allow “lunatics take over the affairs of the state”. He, however, pledged to build psychiatric hospitals to take care of political lunatics in the state. Obi appealed to Anambra people to resist imposition of politicians from outside the state, stating that the people should be allowed to decide their fate. Also speaking at the occasion, Information and Communication Minister Dora Akunyili spoke of the need to ensure that the state governorship does not translate to a negative influence on the forthcoming 2011 election. Akunyili said the signs emanating from the state so far were not complementary. The chairman of the Organising Committee of the forum, Dr. Okey Ikechukwu, said the aim of the seminar was to bring the people of the state together and analyse issues of common interest. He said ASPOF is not a political organisation. Among others in attendance at the occasion were former Vice-President Alex Ekwueme, Progressive Peoples Alliance (PPA) governorship candidate, Hon. Uche Ekwunife; former governor of the state, Dr. Chukwuemeka Ezeife; Special Adviser to the President on Petroleum Matters, Dr. Emmanuel Egbogah and Chief Simon Okeke.